We're on the cover of Employee Benefit News! Last December, Vlad Gyster at Airbo asked me if I'd be interested in talking with Andrea Davis at Employee Benefit News (EBN) for a story she was working on for their January issue about communicating with millennials. Andrea and I talked and then EBN sent a photographer out to our office. He did a whole photo shoot with millennial ASHA staffers and our HR team. Then, the January issue came out and we weren't in it. Bummer. Well, lo and behold, out comes the September issue and we're on the cover. You'll find the story on page sixteen. When you're interviewed for a story like this, you never know how you'll come across. (I've had a garbled quote or two attributed to me in the past.) Nick Otto wrote a good story and I'm pleased that ASHA has been recognized for trying to communicate with staff in an engaging way. That's something that is near and dear to my heart. Jonathan Thorpe was the photographer. I was impressed with how he conducted the shoot and the quality of his work. We had a lot of fun with him. Many thanks to all the ASHA staff that participated in the shoot. Carol Harnett introduced me to Vlad at the HRE Benefits Conference in 2013. 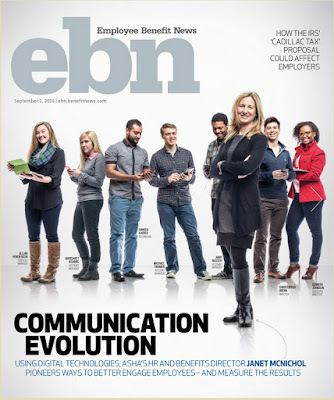 It's led to a fulfilling partnership and now the cover of EBN. I can't wait to see what's next.